MakerBot Industries, LLC is an American desktop 3D printer manufacturer company headquartered in New York City. It was founded in January 2009 by Bre Pettis, Adam Mayer, and Zach "Hoeken" Smith to build on the early progress of the RepRap Project. It was acquired by Stratasys in June 2013. As of April 2016[update], MakerBot has sold over 100,000 desktop 3D printers worldwide. Since 2009, the company has released 6 generations of 3D printers, with the latest being the Replicator+ and Replicator Mini+. It was the leader of the desktop market with an important presence in the media but its market share is in decline. MakerBot also founded and operates Thingiverse, the largest online 3D printing community and file repository. MakerBot founders (left to right) Adam Mayer, Zach Smith and Bre Pettis with the final MakerBot Cupcake prototypes. Smith was one of the founding members of the RepRap Research Foundation, a non-profit group created to help advance early research in the area of open-source 3D printers. Bre Pettis got inspired during an art residency in Vienna with Johannes Grenzfurthner/monochrom in 2007, when he wanted to create a robot that could print shot glasses for the event Roboexotica and did research about the RepRap project at the Vienna hackerspace Metalab. Shot glasses remained a theme throughout the history of MakerBot. The company started shipping kits in April 2009 and had sold approximately 3,500 units as of March 2011[update]. Demand for the kits was so great in 2009 that the company solicited MakerBot owners to provide parts for future devices from their own MakerBots. Seed funding of $75,000 was provided by Jake Lodwick ($50,000) and Adrian Bowyer and his wife, Christine ($25,000). In August 2011, venture capital firm The Foundry Group invested $10 million in the company and joined its board. In April 2012, Zachary Smith was pushed out, involving disagreement on adherence to open source principles, and likely also about integration with Stratasys. Private security led out 100 employees laid off around the same time. On June 19, 2013, Stratasys Incorporated announced that it had acquired MakerBot in a stock deal worth $604 million, with $403 million in stock paid up front, based on the current share value of Stratasys. The deal provided that MakerBot would operate as a distinct brand and subsidiary of Stratasys, serving the consumer and desktop market segments. When acquired, Makerbot had sold 22000 printers. Bre Pettis moved to a position at Stratasys and was replaced as CEO by Jennifer Lawton, who in 2015 was succeeded by Jonathan Jaglom, then in January 2017, Nadav Goshen. In April 2015, it was reported that in an effort to integrate MakerBot's activities better with those of Stratasys, Jaglom laid off around 100 of 500 employees and closed the existing three MakerBot retail locations. then 80 other employees were laid off in October 2015. MakerBot's first products were sold as do it yourself kits, requiring only minor soldering, with an assembly process compared to assembling IKEA furniture. Current models are designed as closed-box products, with no assembly required. MakerBot printers print with polylactic acid (PLA), acrylonitrile butadiene styrene (ABS), high-density polyethylene (HDPE), and polyvinyl alcohol (PVA). The Cupcake CNC was introduced in April 2009 as a rapid prototyping machine. The source files needed to build the devices were put on Thingiverse, allowing anyone to make one from scratch. The Cupcake CNC featured a usable build volume of 100 mm x 100 mm x 130 mm (L/W/H) and has outside dimensions of 350 mm x 240 mm x 450 mm. Because of the open source nature of the product, any suggestions for improvements came from users. During its primary production run (April 2009 to September 2010), the Cupcake CNC kit was updated several times to incorporate new upgrades into each successive version. Introduced in September 2010 at Maker Faire NYC, the Thing-O-Matic was MakerBot's second kit. It shipped with many of the aftermarket upgrades that had been built for Cupcake. The stock Thing-O-Matic included a heated, automated build platform, an MK5 plastruder, a redesigned z-stage and upgraded electronics. It featured a build volume of 100 mm x 100 mm x 100 mm (4" x 4" x 4") and outside dimensions of 300 mm x 300 mm x 410 mm (12" x 12" x 16" L/W/H). The device interfaces via USB or a Secure Digital (SD) card. The Thing-O-Matic was discontinued in the spring of 2012. MakerBot agreed to support the Thing-o-Matic until their supply of parts was exhausted. Assembly instructions are available online through the MakerBot Wiki. The Thing-O-Matic is open-source hardware and is licensed under the GNU GPLv3. As such, the Thing-O-Matic can be heavily altered and improved by users. Some MakerBot operators developed upgrades to the platform that were later incorporated into factory kits. MakerBot has credited those early innovators in their documentation, some of the companies were inspired by makerbot and created innovations in 3D printing like 3D printed dress. In January 2012 MakerBot introduced the Replicator. It offered more than double the build volume of the Thing-o-Matic at 22.5 cm x 14.5 cm x 15.0 cm (8.9" x 5.7" x 5.9" L/W/H). Other features included a dual extruder allowing two-color builds, an LCD screen and a control pad. The Replicator was sold pre-assembled with no kit version available. It was the last open-source MakerBot printer. In September 2012, MakerBot introduced the Replicator 2. This newest model again increased the build volume, this time to 28.5 cm x 15.3 cm x 15.5 cm (11.2" x 6.0" x 6.1"L/W/H) and can print at 100 µm per layer. The dual extruder was changed back to a single extruder head, while the upgraded electronics, LCD, and gamepad remained similar to the original Replicator. Unlike previous models, the Replicator 2 can print only using PLA plastic, which comes sold in sealed bags with desiccate to protect it from moisture. The Replicator 2 is sold only pre-assembled. Alongside the Replicator 2, MakerBot also released the Replicator 2X. The 2X model was intended as an experimental version of the 2 that includes a completely enclosed build area, redesigned dual-extruders, and a heated aluminum build platform – all of which enable printing with ABS plastic and dual-material printing. In August 2013, MakerBot released the Digitizer, a 3D scanner. The product was designed to allow MakerBot users to scan physical objects and turn them into digital, 3D printable models. The accompanying software allowed models to be edited, printed immediately, or uploaded to Thingiverse. In January 2014, MakerBot released its Replicator Desktop 3D Printer with a build volume of 25.2 cm x 19.9 cm x 15.0 cm (9.9" x 7.8" x 5.9" L/W/H). This Fifth Generation Replicator features WiFi enabled software that connects the printer to MakerBot desktop and mobile apps. Also in January 2014, MakerBot released the Replicator Mini with a build volume of 10.0 cm x 10.0 cm x 12.5 cm (3.9" x 3.9" x 4.9" L/W/H), layer resolution of 200 µm, and a positioning precision of 11 µm on the x and y-axis and 2.5 µm in the z-axis. Released alongside the Replicator Mini and 5th Generation Replicator, the Z18 offers a build volume of 30.0 cm x 30.5 cm x 47.5 cm (11" x 12" x 18" L/H/W), totaling over 2,000 cubic inches. Envisioned as a solution for major clients, the MakerBot Innovation Center incorporates hardware (optimized suite of 3D Printers), SAAS workflow software, training services, and enterprise support. The first Innovation Center was established in February 2014 at SUNY New Paltz. Customers are largely universities such as University of Maryland, Florida Polytechnic, UMass Amherst, and Xavier University. Many Innovation Centers increase their surrounding community's access to 3D printing. Until mid 2016, manufacturing was performed in its own facilities in New York, then it was contracted to Jabil Circuit. The New York manufacturing personnel was laid off, while development, logistics, and repair operations remain in New York. MakerBot hosts the online community Thingiverse, where users can upload 3D printable files, document designs, and collaborate 3D printing projects and on open source hardware. The site is a collaborative repository for design files used in 3D printing, laser cutting and other DIY manufacturing processes. MakerBot was featured on The Colbert Report in August 2011. They sent a bust of Stephen Colbert, printed on a MakerBot 3D printer, into the stratosphere attached to a helium filled weather balloon. Netflix published in September 2014 the documentary Print the Legend about Makerbot history. Due to its detachment from open source community, the departure of its founders, reliability problems with the 'smart extruder' and questionable users clauses on the Thingiverse site, there have been many recent controversies around Makerbot. Additionally, the company has lost substantial market-share to competitors such as Ultimaker and Aleph Objects. This has caused substantial backlash from the maker community, which was a cornerstone of the company's user-base. The Fifth generation was equipped with an interchangeable extruder with some self-diagnostics capabilities. It was new in the market and supposed to help printer maintenance but reliability problem occurred with very short lifespan on the extruder, requiring frequent replacement at high cost. This led to a class action lawsuit which was dismissed. Ultimately, Makerbot replaced the failing extruder with a new version. Around September 2012 the company stated that for their new Replicator 2 they "will not share the way the physical machine is designed or our GUI". This departure from the previous open-source hardware model was criticized by part of the community, including co-founder (and now former employee) Zachary Smith. The fifth generation of printers (new Replicator, Mini and Z18) are significantly more closed than previous models. With these models, MakerBot transitioned from open source hardware controllers, extruders, and firmware to proprietary versions of the above. They also changed print file formats from the S3G format used by earlier printers to the new STL format. In 2014, the company faced significant criticism when it filed patent applications for designs that some claimed had been invented by members of its community and published to Thingiverse, such as the quick release extruder. Community members accused MakerBot of asserting ownership over their designs when those designs had been contributed with the understanding that they would remain open source. Then-CEO Bre Pettis released a statement dismissing these critics, citing patents that had been filed for unique inventions prior to any community-created designs, namely that the patent for the quick release extruder was originally filed in 2012 while the open source design was first published to Thingiverse in 2013. ^ "MakerBot Reaches Milestone: 100,000 3D Printers Sold Worldwide". Archived from the original on 2017-01-16. Retrieved 2017-01-05. ^ Biggs, John. "Makerbot doubles-down on its sure bets, professionals and teachers". TechCrunch. Retrieved 2017-01-05. ^ "Check out Thingiverse! Two New Apps Added for MakePrintable Repairs & 3D Hubs Printing Service; New Developer Portal | 3DPrint.com". 3dprint.com. Retrieved 2017-01-05. ^ Make Magazine Online. "Reprap Research Foundation: get yer Reprap parts here". Retrieved 2011-03-09. ^ Fosdem.org. "Interview: Adrian Bowyer". Archived from the original on 2011-03-10. Retrieved 2011-03-09. ^ "MakerBot hat seinen Ursprung in Wien und würde sich an HP verkaufen". 3druck. Retrieved 21 January 2019. ^ "All-Star Lineup Invests in MakerBot". Makerbot.com. Retrieved 2014-01-03. ^ Feld, Brad (August 23, 2011). "Foundry Group Invests in MakerBot Industries". Business Insider. Retrieved August 24, 2011. ^ a b "MakerBot vs. Open Source – A Founder Perspective". Hoektronics.com. 2012-09-29. Retrieved 2014-01-03. ^ a b Pearson, Jordan (April 17, 2015). "MakerBot Just Laid Off 20 Percent of Its Staff". Motherboard VICE. Retrieved 2015-04-18. ^ "3D Printing Company MakerBot Acquired In $604 Million Deal". Forbs. 2013-06-19. Retrieved 2017-12-27. ^ "Stratasys Acquiring MakerBot In $403M Deal, Combined Company Will Likely Dominate 3D Printing Industry". TechCrunch. 2013-06-19. Retrieved 2014-01-03. ^ Etherington, Darrell (June 19, 2013). "Stratasys Acquiring MakerBot In $403M Deal, Combined Company Will Likely Dominate 3D Printing Industry". Tech Crunch. Retrieved June 19, 2013. ^ The Daily Mail Online (2011-03-02). "Tested, the photocopier that'll one day make a Stradivarius". London. Retrieved 2011-03-09. ^ buchanan, matt. "MakerBot Cupcake CNC Delivers DIY 3D Printing for Just $750". Gizmodo. Retrieved 2018-05-17. ^ Rückert, Ulrich; Joaquin, Sitte; Felix, Werner (7 March 2012). Advances in Autonomous Mini Robots: Proceedings of the 6-th AMiRE Symposium. Springer Science & Business Media. p. 53. ISBN 978-3-642-27482-4. Retrieved 2 February 2015. ^ "Makerbot Wiki". Makerbot. Archived from the original on 2011-11-22. Retrieved 30 November 2011. ^ MakerBot Blog (2010-03-22). "MakerBot Cupcake Heated Build Platform v2.0". Archived from the original on 2011-03-05. Retrieved 2011-03-09. ^ DivideByZero (March 2019). "Startup inspired by makerbot to make 3D printed dress". ^ a b O'Brien, Terrence (19 September 2012). "MakerBot unveils Replicator 2, 2X and launches retail store, we go eyes-on". Engadget. Retrieved 2 February 2015. ^ Merz, Theo (23 August 2013). "MakerBot Digitizer: desktop 3D scanner released". The Telegraph. Retrieved 2 February 2015. ^ a b Hughes, Neil (13 April 2014). "Hands on with MakerBot's iOS-connected 5th generation of 3D printers & Digitizer desktop 3D scanner". Apple Insider. Retrieved 2 February 2015. ^ Ngo, Dong (19 May 2014). "MakerBot ships Replicator Mini Compact 3D printer". CNet. Retrieved 2 February 2015. ^ Krassenstein, Brian (5 January 2015). "Ultimaker2 Go & Ultimaker2 Extended 3D Printers to be Unveiled at 2015 CES". 3D Print.com News. Retrieved 2 February 2015. ^ "Elevate Learning with Innovation Centers | MakerBot". www.makerbot.com. Retrieved 2018-04-19. ^ "Campus Technology 2015: Q&A with MakerBot's Jordan Brehove". EdTech. 2015-07-29. Retrieved 2018-01-11. ^ "MakerBot Innovation Center News – State University of New York at New Paltz". www.newpaltz.edu. Retrieved 2017-01-05. ^ "University of Maryland Celebrates Grand Opening of New MakerBot Innovation Center | 3DPrint.com | The Voice of 3D Printing / Additive Manufacturing". 3dprint.com. Retrieved 2018-01-11. ^ "UMass Amherst Library Opens 3-D Printing Innovation Center". lj.libraryjournal.com. Retrieved 2018-01-11. ^ "Xavier U to Launch 3D Printing as a Service -- Campus Technology". Campus Technology. Retrieved 2018-01-11. ^ Hibbard, Laura (2011-08-18). "MakerBot Sends Stephen Colbert's Head into Space (VIDEO)". Huffington Post. ^ "3D Printing Trends Q4 2017". The 3D Hubs Trend Report launches every quarter, using data from 6,000 active service providers creating 1,000,000 3D printed parts. Retrieved 2018-01-11. ^ "Let's try that again". Makerbot.com. Retrieved 2014-01-03. ^ Josef Průša. "Open Hardware meaning | Josef Prusa – 3D tisk a tiskárny". Josefprusa.cz. Retrieved 2014-01-03. ^ "Has MakerBot Become TakerBot?". 2014-05-28. ^ "MakerBot Responds To Critics Who Claim It Is Stealing Community IP". 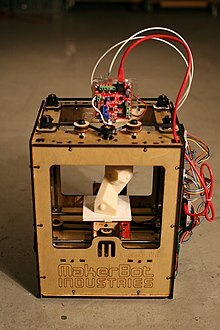 Wikimedia Commons has media related to MakerBot. This page was last edited on 28 March 2019, at 12:40 (UTC).